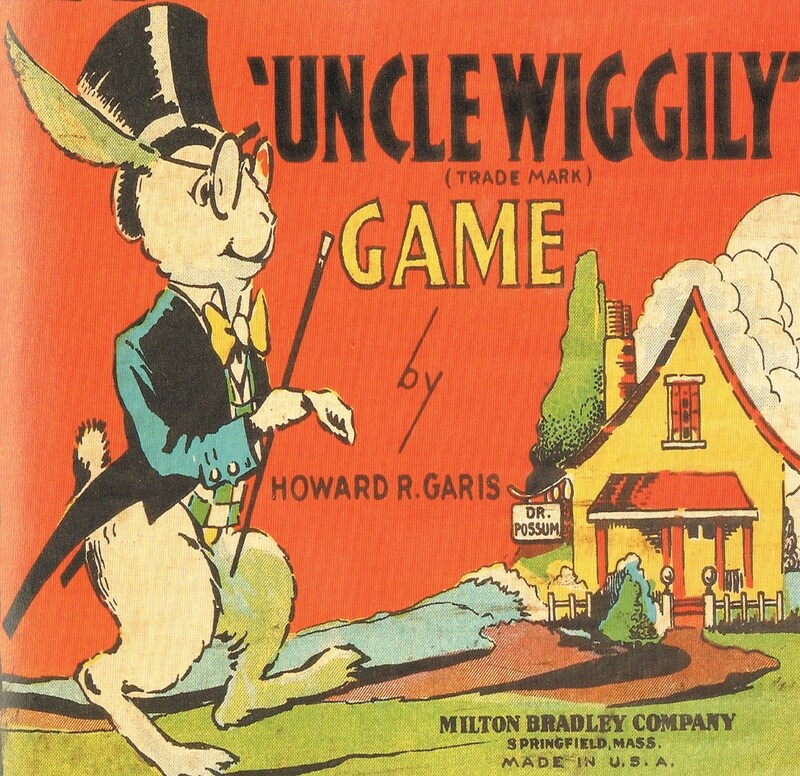 Today I present Uncle Wiggily, originally published by Milton Bradley back in 1916. Intended to be a children’s game, I personally find this to be the stuff of nightmares. Some rhino thing wants to club you. A fancy-looking fox wants to eat you. An alligator with an ascot has sinister intentions. 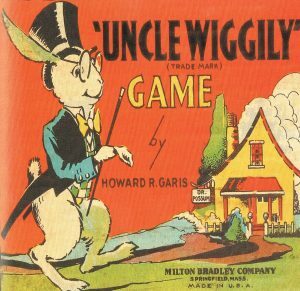 Also, my parents forbade me from going anywhere near my Uncle Wiggily’s house unsupervised, so really this whole thing is a nonstarter. Here’s some thoughts after Pat and some folks played Find It & Bind It at the Boston Festival of Indie Games. 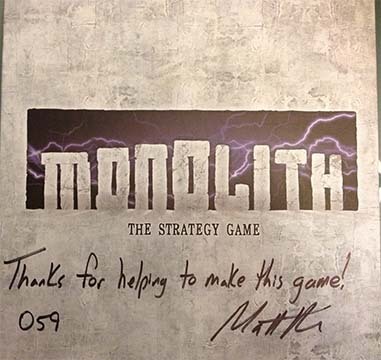 Cray Cray Games was a Kickstarter backer of Monolith, by Goblin Army Games. It’s a shockingly themeless (I don’t think this game necessarily needs a theme.) strategy game of chance. The oxymoronic description is intended as dice-rolling is the primary mechanic. The objective is to get to the Victory space on the score track. Failing that, being furthest on it achieves victory. Roll your dice and try to place them in the areas that will earn the greatest amount of Victory Points or that set you up to gain resources like Gems, Skill or Power Cards. This is pretty quick, especially if you keep your cards in their categories (Skill, Rune, Fate, Power, etc.). Get out the dice and tokens that correspond to a player’s chosen color and 5 gems per player to make available for the game. Set the playing field (11 Rune and 1 Fate Card) for the game. Determine who gets the Primus Token (aka: first turn token) and you’re ready to begin. FYI: There is a 5-card hand limit (mentioned inconspicuously on p8) for Skill (plus Power, if in play) Cards . Roll dice, take turns placing the dice in squares and play Skill Cards and/or Power Cards as applicable/desired. There’s a lot of potential for re-playability given the numerous Fate and Rune Cards. The mechanics are sound and easy-to-understand. There’s also a good variety of content in the different types of cards. I haven’t done any spreadsheeting to plot/track that variability and what it means so I’ll make no comments on balance in that regard. I like that the resources are limited. The gems are bound to 5/person. The Skill and Power Cards are limited to one use of the deck (no shuffling). It forces you to choose and also helps move the game along. The rule book would benefit from a bit of repetition or reorganization so that you can find things more easily. E.g. : I’d imagine things like hand-limit should be in setup vs. where it is. I do think that the unlimited use of Skill Cards in a given turn seems overpowered. If you luck out and get the Skill Card that makes opponents discard a Skill Card — and this card isn’t a one-time use Skill Card, that gets annoying pretty quickly. Very Good: Just like awesome, only it either lacks something or there’s some issue that makes the game just a little less than awesome. Playable (As Is): Fun, playable with decent art/mechanics with minor issues and at most 1 easily remedied major issues. Playable (with Fixes): Potential for fun, but flawed; the game requires fixing before playing again. OK: Not great fun, but it kills time. It might even be playable but most would ask why. Seriously Flawed: The game is so flawed I am beside myself with how it got published at all. It is also nigh impossible to fix (or just requires way too much to fix, including the creation and printing of new cards/mechanics). Article 27: Because everyone should have the power to veto. Article 27 was recently introduced into my regular gaming group and has since become a favorite. Let’s have a look as to why. In Article 27, each player will take the role of a UN Security Council member (U.S., England, Russia, France, etc.) and whose goal will be to have the most Influence Points by game end. Influence Points are gained (and spent as bribes) throughout the game during each negotiation phase. The player who last made a public speech will begin the game as Secretary General and will be given the gavel and the 5-minute timer. Depending on number of players in the game, face-down color-coded tokens will be placed on the main game board. Each of these will have a symbol on the front that may or may not help a player gain bonus Influence Points at the end of the game, if they have a matching Hidden Agenda token. Every round, players will draw 5 tokens from a bag, starting with the Secretary General of the round. These tokens are privately placed behind player screens, and chronologically in the order they are drawn atop the 5 placeholders on each player mat. Each placeholder has a point value associated with it, where, if that particular color token is incorporated into a Proposal for the round, that player receives or loses the corresponding value of Influence Points. The values are as follows from left-to-right: +5, +3, +1, -2, -4. The tokens drawn can be one of 5 colors: red, blue, green, yellow, and black. A face-down token from each color on the main game board will now be revealed to show its symbol. If a symbol matches that of a player’s Hidden Agenda token, it may influence whether they want that color token to be incorporated into the round’s Proposal or not—regardless of whether it appears on their 5 drawn color tokens behind their screen. Once all players have drawn their 5 tokens, the Secretary General begins the round of negotiation by banging the gavel and flipping the timer. They have five minutes to deliberate on a proposal before voting must happen. The Secretary General is particularly invested in having the round’s Proposal pass because there are 5 extra Influence Points on the line for them if it passes—none if it fails or is vetoed by another player. In the following five minutes, players can beg, threaten vetoes (which cost 5 points to kill the Proposal), and bribe other players into accepting or rejecting or bribe the Secretary General himself into including or omitting certain color tokens from the Proposal. Bribes are placed on the appropriate player’s mat in the corresponding section, with the bribing player’s face token atop the bribe (as multiple bribes can be placed, it is important to know who placed what). Bribes MUST be honored if the appropriate action is taken by a bribed player (such as voting to pass a bill, abstaining, rejecting, etc.) But, while bribes may be placed onto a player’s mat to influence their decisions, they DO NOT amount to an acceptance. If a player is bribed 3 points to vote YES on a Proposal but they vote NO instead, the 3 Points are returned to the bribing player. When five minutes are up, or the Secretary General calls for a vote to close earlier by banging the gavel, it is time for players to accept, reject, abstain, or veto a proposal. Vetoes cost 5 Influence Points. All players will take their voting tokens in their hands, secretly select one, and hold it inward with a closed fist. Once everyone has done so, fists are opened, and votes are counted. A MAJORITY is needed to pass a Proposal. Ties are considered failure. If a Proposal passes, the colored tokens that were included in the Proposal by the Secretary General, are placed face-up in the scoring area of the board. Tokens not included are placed face-down in the scoring area. 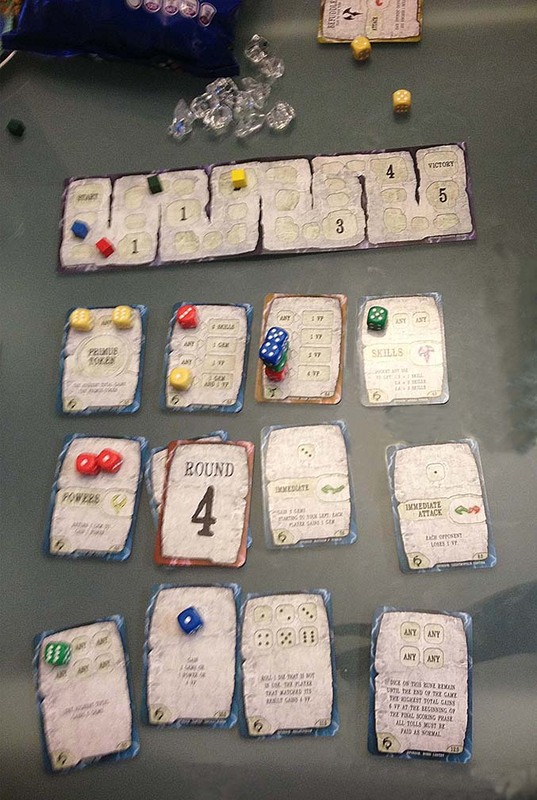 This area makes things easy for players to count any tokens matching their Hidden Agenda at the end of the game. The gavel and Secretary responsibilites passes to the player on their left once everyone has scored their appropriate points, and placed their 5 drawn tokens bag into the bag. Play continues until everyone has had a turn being the Secretary General, or in the case of a 3-player game, everyone will be the gavel-wielder twice. It is nice to have a game with so much player interaction. It is truly a negotiation game, with little else to distract. Game length is roughly 45 minutes. It accommodates 3-6 players. Learning curve is not bad. Stronghold also did a great job with their rulebook and it was not necessary to consult very often upon learning. Excellent components, quality, and a very thorough rulebook is concise, colorful, and clear. Great replayability. Lots of different token combinations each round will ensure that none is like the one before it. I have found it rare (only 1 instance in 5 games played) that a Proposal was voted down. Typically, the players I have played with have found it more beneficial to simply spend 5 points on a veto to swindle others out of many more points for the round if the Proposal is not going their way. Not only does it seem not worthwhile to vote to reject instead of veto, but I have yet to see somebody abstain. These seem like under-utilized features to me. The yellow-colored Agenda-related tokens are EXTREMELY hard to see. I am normally not bothered by things like this, but it is truly difficult to see the symbol on the yellow tokens. As such, I have drawn over them with permanent black marker. The only component mis-step in the game that I can think of. I have found no personal problem with the 5 values displayed on each player mat (the numbers +5 thru -4) but others have argued that the current values allow for everyone to gain 3 points per round if every color is included, so why not do it each time? I find that a silly question. It’s not a co-op game. Why would you want to have everyone win? lol. I would never pass a Proposal with all 5 tokens involved. I really enjoy this game and imagine it will be a staple in our gaming group. 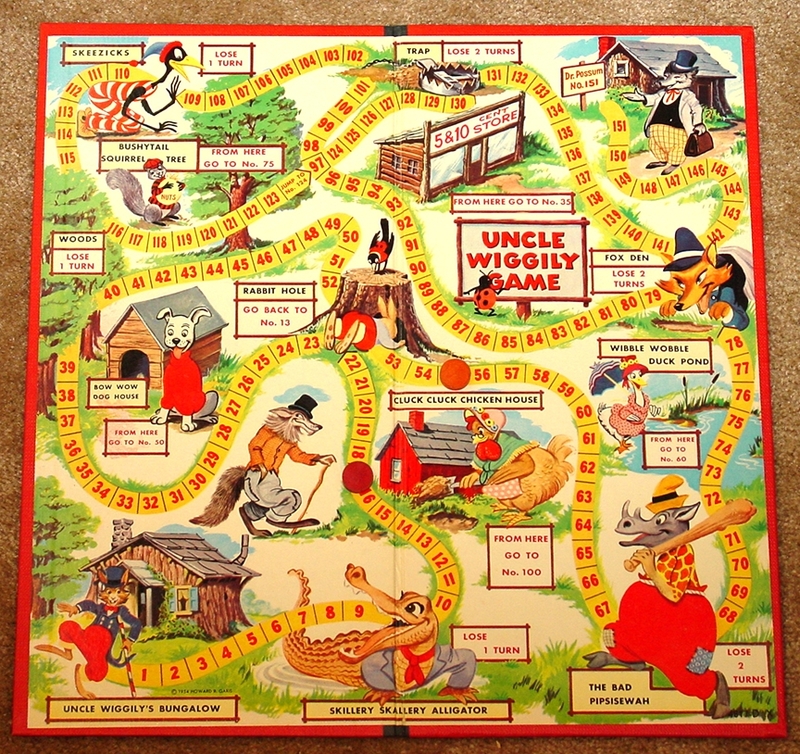 Everyone I played with liked this game. Nobody hates this game. It was pleasantly surprising to have everyone embrace a negotiation political game that typically my group finds dull. Stronghold has done an excellent job with Article 27 and I encourage you to try it out, if not own it. Nachos and booze not included. Isla Dorada is a game that flew past me unnoticed. Surprising, as it is another top-quality production from Fantasy Flight. Here is a quick overview of the game with my personal take on it. 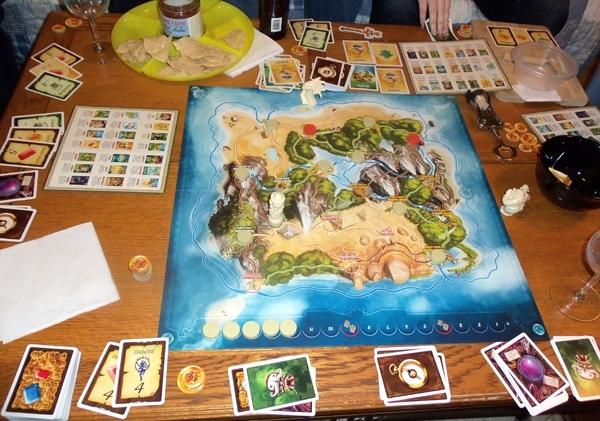 The premise of the game is that each player is an explorer on an island who is seeking out the greatest number of treasures and goodies. The player with the highest point total accrued from treasures and the like, wins. The catch is that explorers must travel together. You can’t go off on your own. A totem pole pawn will be placed at a base camp site on the middle of a pretty board, and this will represent everyone’s movement from place to place. Destiny Cards: These will have secret objectives on them that you will want to achieve. They range from, say, “Explore X number of areas” to “Explore these specific areas” to “Get this many treasure cards” or “Make sure nobody travels by sea” They are varied and very interesting cards—all with various point values associated with the successful completion of each. Players will initially be dealt 2 of these, keep one, discard the other. Curse Cards: The reverse of Destiny Cards really. Each player will be given one of these. Instead of awarding you points for an objective, they are deterrents. They will instantly give you negative points of you travel to “X” location. Treasure Cards: These are cards with various pretties on them along with a point value and location. If you can sway the explorer totem to land on said location, you get to place the treasure card infront of you and are awarded the point value. You will be given 3 of these to start, of which you choose 2 to keep and discard the remaining one. Adventure Cards: These are the meat and potatoes of the game. Primarily they serve as the “currency” with which you influence the movement of the exploration party. There are also some treasure cards mixed in and some event cards that range from giving curses to other players to drawing more treasure or destiny cards. Players start with 6 Adventure cards. Players also start with 10 gold coins…but contrary to intuition, these are not really the main currency. They are a fueling mechanism for certain Adventure cards that require you to pay for their usage. They aren’t used for any other purpose and players will never have more than the 10 gold they start with, and they don’t even need to use any gold throughout the game. If you don’t use gold to fuel adventure cards, you get 1 point at the end of the game for each gold unspent. 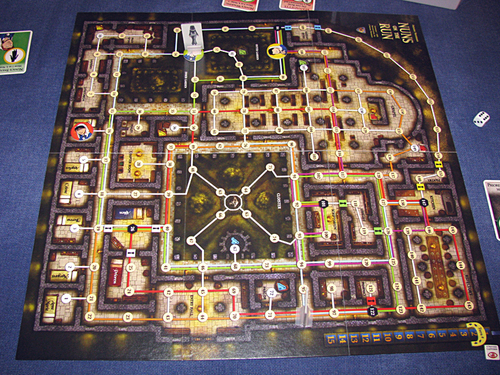 It consists of 16 turns, which are indicated by a turn track on the board. Everytime the explorer totem moves, a disc from the turn tracker is removed and placed on the traveled-to location. 1. Bidding phase: Bidding is how you earn the right to move the explorer totem. Bidding is done entirely through the use of Adventure Cards. Most Adventure cards will have a symbol on the top-left indicating a terrain type (desert, mountain, water, jungle). For each symbol of a type, you may bid “1” to move the totem along a path of that corresponding terrain type. If you have 3 yaks, you can bid 3 to move along an adjacent mountain path. There are other cards that allow for long range travel with the use of gold coins. There are also cards that alter terrain type on cards. Those special cards aside, this is essentially a bidding war of “who wants to go in what direction the baddest?” If you are adjacent to a location where your Curse Card will initiate and cause you to lose 6 points, then you are really motivated to bid in the opposite direction. Conversely this is true for people with Treasure Cards or Destiny Cards that will want to go that direction. The tug of war bidding goes clockwise from the leadership token (possessed by the youngest player to start, and later by the winner of the previous bid) and goes until nobody can outbid the highest bid, or simply passes. 2. Movement Phase: Now you simply move the explorer totem to the bid-upon spot. Place a disc from the turn track marker on this spot to indicate it has been traveled to. Anyone with Treasure or Curse Cards relevant to the current location should now immediately place those Cards infront of them face-up. These will now officially count towards point totals at the end (whereas if they remain in your hand, they do nothing). 3. News Flash Phase: This will only become relevant on turns 4 and 9 (as indicated by red discs instead of beige). On these turns, players will get to draw additional Adventure Cards and choose one or more to keep. 4. Adventure Card Phase: Regardless if you spent money in the Bidding Phase or not, all explorers starting with the holder of the Leadership Token will get to draw 1 Adventure Card. This can either be from the top of the deck, or from the 4 Adventure Cards currently showing in the face-up pool. If one of these cards is chosen, another is immediately flipped to replace it. Rinse. Repeat these phases until the end of turn 16. Count up your points, including the reveling of any points achieved from Destiny Cards. A winner is declared. Woot! It is nice to have a game with so much player interaction. Not just with bidding, but also with bluffing and speculation of where others are trying to go. Game length is anywhere from 45 minutes to 75 minutes. It accommodates 3-6 players. Learning curve is not too bad. Fantasy Flight did a great job in making little “cheat sheets” to remind people what every possible Adventure Card is, as well as all Destiny Cards. I imagine this to have pretty good replayability. Lots of different card combinations at the beginning and throughout will make sure no game is the same. People found the 10 Card Hand Limit frustrating—particularly when they couldn’t conceivably win a bid with their cards to get rid of them. Not super complex or strategy-driven. You pretty much know where to go from the beginning of the game once you have locations on your starting cards. In this sense it is very much like the game Ticket To Ride—destinations and routes are obvious, it’s just a matter of getting there. Lack of ways to achieve new objectives. There are very few Adventure Cards that allow for the drawing of additional Treasures, Destinies, or Curses. I think there should be a lot more of this to keep it interesting. I liked this game. 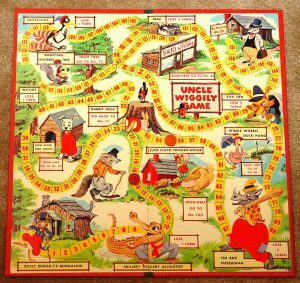 Everyone I played with liked this game. Nobody loved this game. I would consider it a good, quick game to bust out every once in a while to play. It’s likely that everyone will enjoy it and nobody will complain or cringe if its box is pulled from the shelf and placed in front of them. The rules are pretty straight-forward and I find the mechanics interesting. More importantly, it was just an enjoyable, light-hearted game. The objective is to collect a certain number of points which is based on how many people are playing and the approximate duration of game you’re looking to play. One thing to note, when 4 people are playing, you’re encouraged to play as 2 teams of 2 (alternate seating) so that points can be combined and the win condition is met a bit faster. We didn’t quite catch that and we played a fairly lengthy individual 4-player game. And it was still fun. Once we realized it would already be over we continued playing it individually to get a winner based on how we started. It’s actually not that hard once you get a handle on the many decks of cards and notice that the card icons tell you exactly where to put the shuffled decks. There’s some assembly of individual decks (the cards you start based on the chosen character image, a dog that finds you gems, a peaceful dragon which is just a waste card and a to-be-selected artifact). With some flying carpet tokens and deck reshuffling tokens you’re on your way. You have 5 cards in your hand that are active for your turn and you can perform free actions (using a card’s power which is determined by a few icons OR using flying carpet tokens to move beyond monsters w/o encountering them). Then you perform one action for your turn which is either adventuring (which means using cards to subdue a creature and move beyond it) or encountering the statue in your space or completing a quest in that space. If adventuring, you can subdue a creature and repeat that for as many cards as you have that can subdue adjacent creatures in your path. Subduing creatures is done by matching the weapon type of your cards (top left corner) to the “subdued by” type-image(s) on the bottom of the creature (or quest) card. Every creature subdued in this manner get added to your deck for later use and moves you ahead to the next position on the board. That adventure+move mechanic is what lets a player have a chain of subdued creatures in a single turn. In our game, depending on what’s out, some got lucky and were able to subdue 4 creatures in a turn and there were some turns where no one had the cards to subdue anything near them. Once we got the rhythm going, we could complete turns fairly quickly without a lot of downtime in between turns. For once, I don’t believe I had any problems with this game at all. Things seemed clear and I was able to answer any questions that came up with relatively quick reviews of the rule book. That’s truly a big thumb up! Why not Awesome? It’s fun and I’ll play this often whenever we’re only a group of 4 people or fewer but it’s a little kiddy to me. I’d probably rate it as Awesome if it accommodated 6 people (the size of my regular gaming group) and that might make me discover more about it… or if it were just a little more… exciting? Not sure. You can see the complete review and please share with your gamer friends. This game has deduction in it, very similar to Clue or Mystery of the Abbey and also has a party-type feel like Resistance or Werewolf. So if you’re interested in the negotiation or deduction aspects of a game, this game will be very interesting to you. There’s a lot of accusations and interesting things flying back and forth. And of course the theme is funny. The situation cards make me laugh — mostly because of what the wicked people do. Damn you Fantasy Flight! You make everyone else look bad with your fanciness! The dreadnaught fleet alone makes me want to flip the table in an envious rage. That said, I enjoy Rex a lot. My gaming group has mixed opinions on it though, so it hasn’t won everybody over. Let’s look. I admit I have not played Twilight Imperium, from which this game is a spinoff in theme and characters. Although I understand in terms of gameplay, it is entirely different and is not the epic 4+ hours that Twilight Imperium boasts. So, you will be getting a review from somebody totally unfamiliar with its predecessors. 1. Influence phase: Influence tokens (essentially currency) are dropped onto the board by revealing the top Influence card which will have 2 random locations on it. Influence will only drop onto board spaces with a blue icon. These provide incentive to travel to spaces that may otherwise be undesirable. The need for cash is pretty great in this game. 2. Bidding Phase: And here is where Influence is most needed/used. 4 Strategy cards (battle tactic and other beneficial cards) are pulled from the pile and kept face-down. Players go around the board, taking turns and bidding a number of influence per card. If they are the highest bidder, they receive the card. Maximum hand size is 4 (except for 1 race who can hold 8). 3. Recruitment Phase: Players recruit a set number of troops from a dead pool for free, and may pay influence to recruit additional troops or any dead leaders for their assigned strength value. 4. Maneuvering Phase:Perhaps the longest phase in the game, this phase has 2 parts. A deployment phase where readied troops (troops not in the dead pool but not yet on the board either) can be deployed onto any space on the board—whether you control it or not. This costs influence, and costs twice as much if you deploy into a space that is already occupied. Allies cannot occupy the same space. The second part is actual movement. You may move 1 set of troops on a space to another set of troops on a space. Movement is typically 2 spaces, but can be increased by certain spaces and strategy cards. 5. Battle Phase: If any 2 players are in the same space (with the exception of the ever-peaceful galactic council) a battle occurs. Battles, at least in my gaming group, are the most contentious part of Rex. Some love it. Some hate it. It is essentially a bidding and bluffing exercise in risk and loss management. 2 players are given little battle cards with a spinning dial on it and mutliple placeholders. The dial indicates how many troops you will be engaging in the battle, and the placeholders are for placing in a command leader. Depending on which placeholder you plop your leader into, this also indicates what strategy cards you will be using, if any. There are weapons and shields that can be deployed. Once both players have set their battle cards, they are revealed simultaneously. Weapons and shields are used first (and determine if a leader is killed) and then leader value + troop value = your battle score. The player with the highest score “wins” the battle and retains control of the space. The other player’s troops are eliminated. No matter what amount of troops you risk on your dial—they are ALWAYS killed. Even if you won the battle. This means if you risked 10 troops against your opponents 4 troops—those 10 troops are killed. Whatever troops you didn’t risk will remain on the space. Some like this. Some hate this. 6. Collection Phase: Any players controlling a space with influence tokens on it will get to pick up those influence tokens (2 tokens per troop). After a bloody battle, you may not be able to pick up the full amount of influence tokens on a space—this needs to be a factor in what you risk in battles. Rinse and repeat these phases until there is a winner/winning team. In some cases it may not last 8 rounds. In other cases there will not be a clear winner by the end of the 8th round, in which case certain alien races have an instant-win condition in such an event. There is also an optional variant where Betrayal Cards (included in the game) can be distributed at the game’s onset and used to steal a victory from allied players if certain conditions are met. It is nice to have a game with so much player interaction. Not just with battles and bidding, but also with alliances that can constantly change. Game length is anywhere from 45 minutes to 90 minutes. Perhaps longer if it is somebody’s first time playing through. Learning curve is not too bad. The phases are located on little “cheat sheets” to remind people what is happening, and most of the phases are brief. Alien races are pretty well balanced and interesting. They all afford you some great abilities, and lend themselves to particular strategies and alliances, but each game I’ve played so far has been different. Excellent components, quality, and a very thorough rulebook that even includes a lot of backstory to the game. The Maneuvering Phase is the most confusing for players I’ve found. It entails 2 parts and gets people jumbled up—deployment AND movement. The battle mechanic in this game is by far the most polarizing aspect. I enjoy it/don’t mind it while others hotly detest it. I understand both sides of the argument and just caution people to understand the mechanic before playing/purchasing the game if you don’t think your friends will enjoy it. Or, you can always devise your own agreed-upon house rules for how you want combat to go. The other aspect to battle that people have complained about is how 3-way battles go. 3 un-allied races can end up contesting the same space and have to battle it out, but there is no 3-way mechanic. 2 players must fight, and then the winner will fight the 3rd person with whatever troops and leaders they have left-over. This certainly is a difficult feat for the person having to fight 2 back-to-back battles. I agree that a 3rd battle dial would have been nice. I like the replayability of this game, as well as the unpredictability and diversity in strategies one can have to win it. The rules are pretty straight-forward and I find the mechanics interesting. Without having played Twilight Imperium, I would say this is a pretty original game. It’s got a bit of Risk-style conquest to it, but without the luck of dice. It’s all about reading your opponent and anticipating what friends and foes will be doing. A big shout-out to Fréderic Moyersoen, the game’s creator, is in order. I think Nuns on the Run is a very unique, ingenius concept in its design. I wish the execution of it had been tidier. Let’s take a look. Nuns on the Run is essentially a game of Hide-And-Seek with a big twist. The twist being that most players will be novices on a mission to scour an abbey at night to find a key that will unlock the door to their “secret wish” and then get back to their bedroom without the 2-woman team of nuns catching them. 1 or 2 people will play the nun guards while all other players will be a novice. Novices are all given a set of identical movement cards ranging from running to standing still. They are also given a Secret Wish card which they must achieve before the end of the 15th round of play. The Nuns are tasked with preventing any novices from achieving their secret wish, or by catching as many novices as there are players in the game. Novices will begin in their respective bedrooms and each turn they reveal face-up a movement card of their choice. They do not actually move a physical piece around the board however. They write down the corresponding number of the space they land on, onto a secret movement tracker pad provided in the game. After they record their movement for the round, they must roll a die. The higher the die roll, the louder the novice was when moving this turn. If they are within a die roll’s amount of spaces from a guard, they must put down a noise token in the general direction in which the guard heard a noise. Slower movement cards (such as sneaking as opposed to running) will decrease the noise die roll by a given amount. So, players can move slow and steady but risk not attaining their wish, or they can go faster but be at a constantly higher risk of being heard. In addition to making noises, novices also have to worry about being “seen.” If at anytime a novice is in a guard’s line of sight, they must put their face token down on the board where they were spotted. Guards can “catch” a novice by landing on their face token—thus stealing their secret wish away and sending them back towards their bedrooms. Until a guard sees a novice or hears a novice, they are forced to walk along pre-set paths according to route cards and corresponding color paths on the board. On the guards’ turn, even if novices are out of sight and aren’t heard making noise, the guards still get to make a listen roll—which works the same way as noise-making but without the movement/sound modifiers involved. Love the game’s concept and theme. Original, fun and appropriate for many age groups. For between 2-8 players it has a lot of flexibility in group sizes. It’s easy to finish a game within 60-90 minutes and moves quickly. 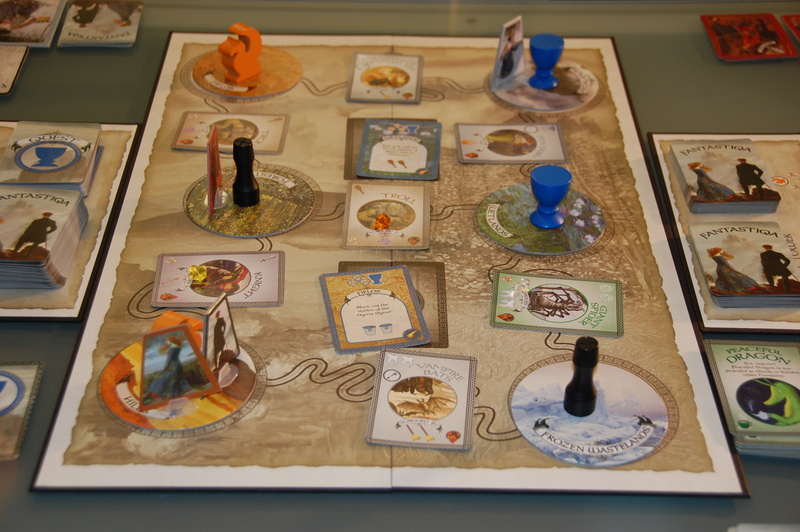 Good replayability as secret wishes, paths, and destinations change between games. “Blessing” cards exist to give each player an opportunity to get out of a jam. The rulebook does a very poor job of explaining certain parts of the game. Particularly our group has had problems figuring out when a novice can be heard on the guard’s turn. There’s no explicit direction that says whether movement cards used are in effect for “listen” rolls. Line of sight is also hardly clear at times. A straight line can’t always be drawn from dot-to-dot to determine whether one can be seen. Other vagueries are when one guard spots or hears a novice, and the other guard is nearby—can that guard also “see” or “hear” the novice and give chase? There are a lot of things that need clarifying in this rulebook. House rules can solve a lot of the issues, but expect them to come up repeatedly. The learning curve can be steeper than one would expect because of the vagueness of the rulebook. Expect the first game to take much longer than it should. Subsequent games should be within 60-90 minutes. Depending on which novice you are (which room you start in) and which Secret Wish you are randomly dealt, you could have a very easy time beating everyone else in the game, or a near impossible process. The differences in difficulties can be extreme. I would love to give this game a higher score because I love the original concept so much. I think it’s great that 8 people can sit around a board with 2 nuns chasing misbehaving novices around in secret. It’s just so odd and eclectic that I have to smile. And truly—in the right group this can be a very fun game. If you have someone that is good at playing the guards and really giving the novices a run for their money—it gets competitive, tense, and funny. However, this game suffers from a lot of ambiguity in rules. If you don’t mind sorting a lot of them out for yourself, then I still recommend this game. 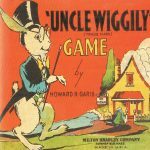 There are others that will be entirely put off by it and don’t want to expend the effort in sorting out a published game. I can certainly see both sides of the equation. 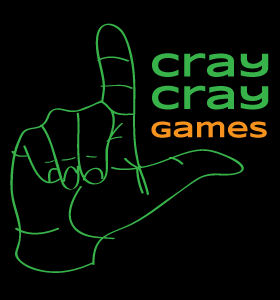 Copyright © Cray Cray Games. All Rights Reserved.